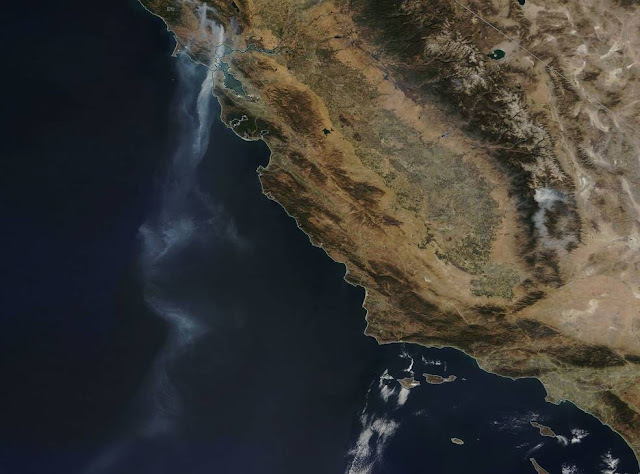 NASA’s Terra satellite saw a stream of smoke that extended over 500 miles from various fires raging in northern California out over the Eastern Pacific Ocean. Credits: NASA image courtesy Jeff Schmaltz, MODIS Rapid Response Team. As the death toll rose to 40, firefighters struggled Saturday to get the upper hand against several massive wildfires that have ravaged Northern California for almost a week. Strong winds kicked up overnight in the central Napa Valley region, causing some fires to spread and triggering evacuations in Sonoma and elsewhere, officials said. 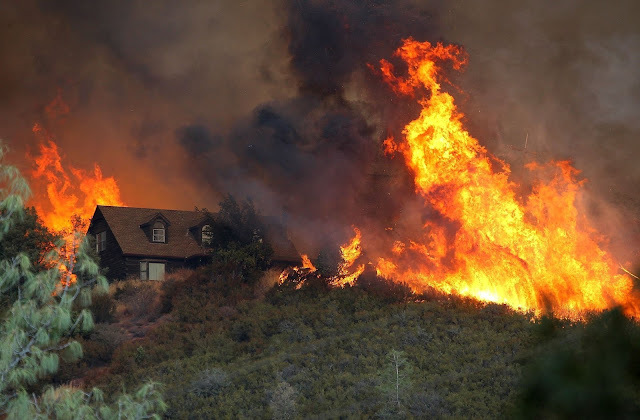 Fire officials feared that winds forecast for Saturday would be similar to those that stoked the first flames on Oct. 8 and that have since exploded to more than 15 fires that have scorched 220,000 acres, destroyed an estimated 5,700 structures and caused at least 40 deaths. Despite low humidity and red flag warnings throughout the region, however, the winds appeared to calm down Saturday afternoon, aiding firefighters who have been battling the fire around the clock, officials said. Officials warned that the biggest threat remains the low humidity, with the dry air continuing to transform grass and vegetation into fuel. "It's been drying out the mountains," said National Weather Service forecaster Steve Anderson. "It's still going to be bone-dry out there overnight." Northerly winds, similar to Southern California's Santa Ana winds, are expected to move across the region at about 15 mph overnight with some 25 mph gusts, he said. Temperatures are expected to drop into the mid-40s overnight, with temperatures expected to hover in the mid-80s Sunday. More than 10,000 firefighters from California and other states are fighting the fires in Northern California, said Dave Teter of the California Dpeartment of Forestry and Fire Protection, and officials are readying more crews in Southern California, where red flag warnings are in place through Sunday. Firefighting efforts include 880 fire engines, 134 bulldozers, 224 hand crews and 138 water tenders, Teter said. At first light Saturday, 14 helicopters were in the air conducting water drops. 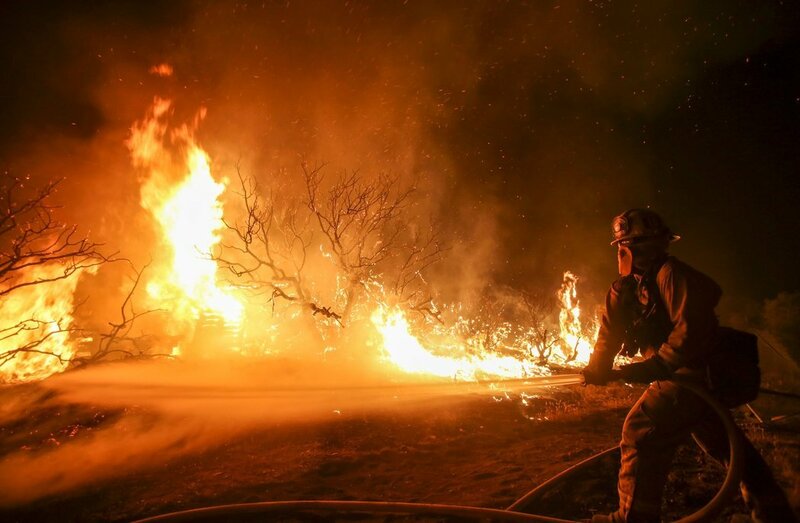 During a night of strong winds, the 46,000-acre Nuns fire in Sonoma County grew by at least 300 acres, threatening the outskirts of the city of Sonoma and the Oakmont neighborhood in Santa Rosa. It was 10% contained as of Saturday, and had destroyed some buildings in the city of Sonoma. Firefighters were asleep in Healdsburg early Saturday morning when they got the call around 3:30 a.m.: Get over to the Oakmont neighborhood of Santa Rosa. High winds had sent the Nuns fire branching toward the city, which had already been devastated by the Tubbs fire earlier in the week. Another branch was heading toward the city of Sonoma. When firefighters arrived, police were helping to evacuate the area. "I don't think I've ever seen that many cop cars Code 3," CalFire spokesman Jeff Allen said, meaning they were flashing their lights and blaring their sirens. The firefighters headed up the ridge in the darkness, trying to hold the flames at bay with hoses and shovels. When the sun came up, air tankers and helicopters started dropping fire retardant and water. 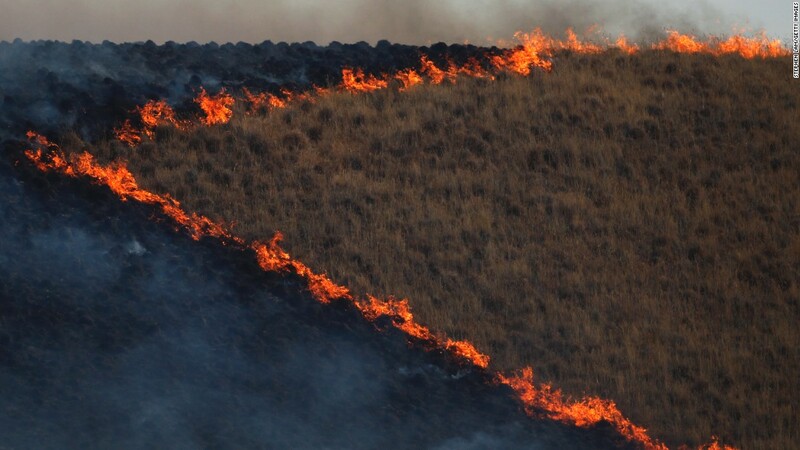 Bulldozers cut through the earth to create fire breaks and firefighters set backfires to slow the blaze's advance. They were helped by the weather as winds started to slow later in the morning. The ridge remained blanketed with smoke late Saturday morning as helicopters circled. 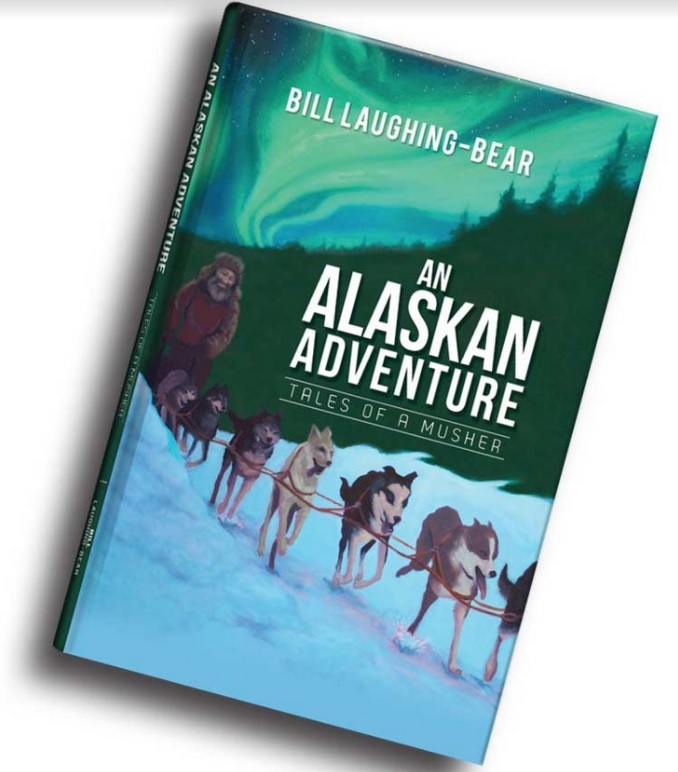 Occasionally a tall tree would become engulfed, and flickers of flames would be briefly visible from the road. An offshoot of the Nuns fire, which ignited early Saturday when a downed power line touched a tree branch, has grown from 300 acres to more than 400 acres in several hours near Oakmont, Cal Fire operations section chief Steve Crawford said Saturday afternoon. Flames were pushing east, and closer to Highway 12, he said. Firefighters are also working to hold flames back from reaching the outskirts of Sonoma. The wind "has hit us pretty hard, and there's a pretty good firefight going on in the field right now," Crawford said. Winds have also stopped some air tankers from making water drops on flames closer to St. Helena, Crawford said. Twenty-two people have died in the Tubbs fire in Sonoma County, eight in Mendocino County, four in Yuba County and six in Napa County. Napa County officials identified two new victims of the Atlas fire as George Chaney, 89, and Edward Stone, 79. The two men owned a house in the 2300 block of Atlas Peak Road, where officials found their bodies Thursday, county spokeswoman Molly Rattigan said. Much of their neighborhood was reduced to debris after the Atlas fire scorched 50,403 acres. The fire, which continued to threaten about 5,000 homes,, was 48% contained Saturday evening. All around, the view was one of entire hillsides charred black and some wineries with nothing but brick frames and melted equipment. Just down the road from the house where Chaney and Stone were found, one spot remained untouched by the fire: the Bubbling Well Pet Memorial Park, a pet cemetery on Atlas Peak Road. The park was still covered in lush, bright green grass. The sound of its babbling brook was interrupted intermittently with the sound of a firetruck or utility crew's diesel engine powering up the mountain to extinguish hot spots or continue the arduous task of reconnecting the mountain residents' homes to the valley city below. On Saturday afternoon, a deer and two fawn found shady refuge under an oak tree as smoke from the Nuns fire could be seen rising from the hills on the other side of Napa Valley. One of the wettest winters on record, followed by the hottest summer on record, has created possibly the worst potential for fire in Napa County that the state has seen, a Cal Fire spokesman said Saturday. Experts use a scientific formula to determine the potential of a fire, called the energy release component, said Cal Fire spokesman Mike Smith. On Saturday, that potential was the worst "in recorded history," Smith said. Crews have not seen this amount of fuel this dry in the path of a fire in at least 26 years, he said. "Today is going to be a much different day than you've experienced unless you were here" from the beginning, Tom Wright of the National Weather Service told fire crews in Napa at a Saturday morning briefing. "It's a really critical day." The Atlas fire saw 35-mph winds over ridge tops Friday night, blowing to the south and southwest. The fire is continuing a slow march north toward Lake Berryessa, Smith said. The fire spread slightly along its southern and northwestern edges overnight, officials said Saturday morning. The strongest containment lines have been built around the southern and western faces of the fire, closest to the city of Napa. But Napa County officials expressed optimism at a Saturday news conference, saying they were confident that the Atlas fire would remain under control. Around 9 a.m., as supervisor Belia Ramos spoke, winds were light and no new evacuations were expected. No one was going to be allowed into the evacuation areas Saturday, officials said, because Caltrans was spending the day trying to restore the roads. 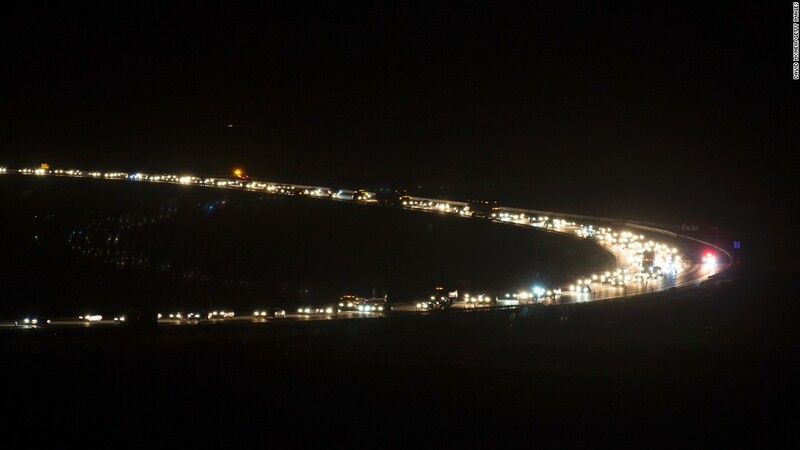 The National Guard has been called in to help the California Highway Patrol block the roads, as Caltrans crews in the hills work to remove rocks, mud, burned trees, fallen branches and downed power lines, CHP Capt. Chris Childs said. Locals have been urged to avoid trying to help the cleanup. The county public health director declared a local emergency in order to bring in more resources to remove toxic ash and burnt remnants of homes and cars. Of 224 people unaccounted for in Napa County, 146 have been found safe, four have been identified as dead and 74 remain missing, Rattigan said. But the combination of high winds and high temperatures raises the potential for burn areas to expand quickly, officials said.Crews continued to gain ground against the 35,270-acre Tubbs fire, which is 44% contained. The nearly 11,000-acre Pocket fire, east of Geyserville, is 5% contained. In Mendocino County, the 34,000-acre Redwood fire was 20% contained as of Saturday. Taken together, the death toll from the wildfires in wine country has exceeded that of the 1991 Oakland Hills fire, which totaled 25. The Cedar fire, which swept through San Diego County in 2003, killed 15 people and destroyed more than 2,800 structures. Officials expect the death toll to rise as search efforts continue in neighborhoods from Santa Rosa to the hills of Napa County. The Federal Emergency Management Agency is conducting damage assessments, providing aid to local agencies and offering federal funding to residents affected by the fire, the agency announced Saturday. The road to repair will be a long one. In Napa near Atlas Peak Road, 51-year-old Robert Vickham controlled the traffic flow on a two-lane highway with a sign as his colleagues at Traffic Management Inc. methodically cut down eucalyptus trees lining its edges. "We're going to be here for weeks," the Pittsburg resident said. "I'm 51 and been in California my whole life, and I've never seen a fire this bad." Teams like Vickham's dotted the Atlas fire's burn scar area first hit by the flames last weekend. Slowly but surely, every tree in the way of a damaged utility line is going to come down, he said, with tall brown power poles down the hill waiting to fill in the gaps. Gov. Jerry Brown and U.S. Sens. Dianne Feinstein and Kamala Harris visited affected areas of Sonoma County on Saturday. Brown has declared a state of emergency for Solano, Napa, Sonoma, Yuba, Butte, Lake, Mendocino and Orange counties. The Canyon 2 fire in Anaheim Hills was 70% contained as of Saturday morning. "The devastation is just unbelievable. I just drove by hundreds of houses that were totally destroyed," Brown said during a news conference at Santa Rosa High School on Saturday afternoon. Harris shared his awe after their tour of the devastated areas. "It's unpredictable. It skips over certain houses. It's not logical in the way that it burns," she said. Despite the visits, there's often little politicians can do on the ground when wildfires strike besides comfort people who lost their homes and monitor emergency efforts to make sure they're getting the help they need. But Assemblyman Jim Wood has another job. "Most of my work is in the morgue at this point," he said. A Democrat from Healdsburg, Wood also is a dentist who is helping law enforcement identify victims of the deadly fires in Northern California. Wood represents an enormous, mostly rural district stretching from Santa Rosa to the Oregon border in the north. There aren't many people in the country with his skills and experience. So when the latest fires started, he said, "I knew at some point I would be called." It's the kind of work he's done with sheriff's offices in counties like Mendocino and Sonoma for years. Sometimes bodies are recovered mostly intact. Other times, there are only bone fragments. It's slow work, and getting the right dental records to identify the remains can be difficult. "It's a process that will take awhile," Wood said. At a time when distraught families are desperate for information about missing loved ones, Wood said he is grateful there's something he can do to help those families. "There's times we're all standing around wondering what to do," he said. The dental work, Wood said, "gives me a sense of purpose."